The SaVaSa Trio from Frankfurt, Germany presented a workshop and performance at Sallie Zetterower Elementary School in Statesboro on Feb. 14, 2017 with support from a Georgia Music Foundation grant. The trio consists of members of the internationally acclaimed Ensemble Modern, which has been at the forefront of contemporary music since 1980 and is perhaps best known in America as having worked with Frank Zappa. Sallie Z. staff coordinated the workshop and performance in partnership with Dr. Martín Gendleman, Ph.D., assistant professor of music, at Georgia Southern University, which hosted a mini-residence for SaVaSa Trio in February. 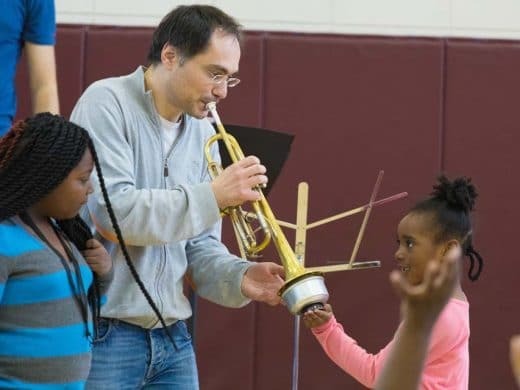 The idiosyncratic and incredibly virtuosic brass trio, including trumpet players Sava Stoianov and Valentin Garvie and French horn player Saar Berger, engaged more than 500 students in second through fifth grades with a lively interactive program. 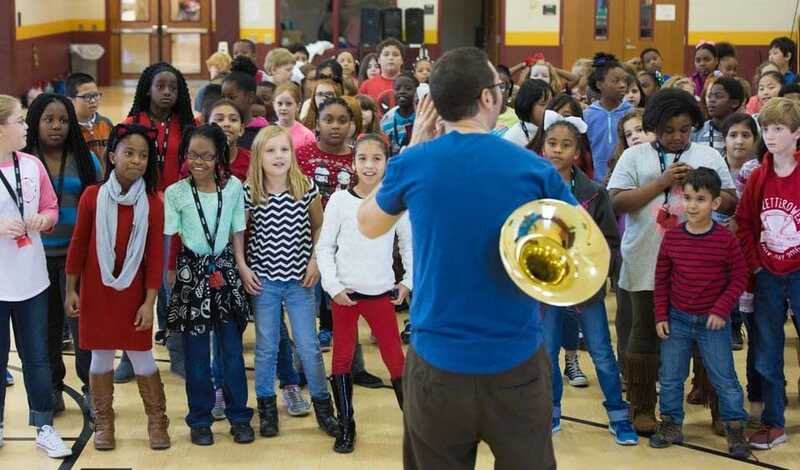 “For a brass trio that plays around the world to come here, and for students to hear music beyond just what’s played in Ms. Davidson’s classroom, shows it comes from all over the world,” said Sallie Z. music teacher Sydna Davidson. For more about Sallie Zetterower Elementary School, visit https://szes-bcss-ga.schoolloop.com/.